The Amsterdam News was founded over 100 years ago by James H. Anderson and was named after the street where he lived and where the first issues were produced and sold. It was one of only 50 Black newspapers in the United States at that time. 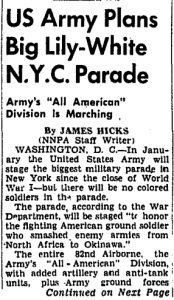 From front page of New York Amsterdam News, Saturday, December 15, 1945. The newspaper became a prominent voice for black Americans, it was a strong advocate for the desegregation of the U.S. military during World War II, and also covered the Harlem Renaissance. From the 1950s and 60s onwards it gave dedicated support to the civil rights movement in America. Over the years several prominent African Americans have written for the Amsterdam News including Malcolm X, W.E.B. Du Bois, Adam Clayton Powell Jr. and Roy Wilkins. 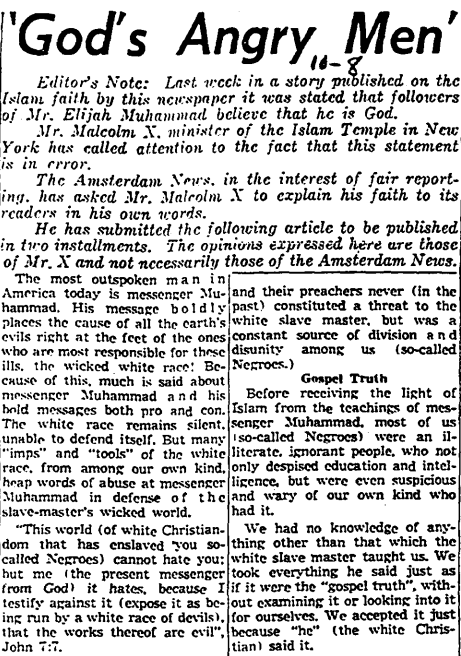 Screenshot of ‘God’s Angry Men’ by Malcolm X from New York Amsterdam News, Saturday, April 27, 1957, p. 18. New York Amsterdam News from ProQuest allows you to search and browse issues from 1922-1993. Issues have been scanned from cover to cover so you also get to see advertisements, photographs and illustrations, obituaries, etc. *Unfortunately due to various slight name changes over the years and different editions there are 6 separate entries for the Amsterdam News on DiscoverEd. The Library has access to a large number of newspaper and magazine (periodical) archives and you can access these from the Newspapers & Magazines database list. This entry was posted in Library, New, Online resource, Primary sources and tagged 20th century, Black history, cultural history, Databases, History, newspapers, primary source, United States by cstirling. Bookmark the permalink.